We discover, train and support the best of the best. We are grooming key players to break into the world top 100 by 2022. With the help of customised wheelchairs, access to gyms and nutritionists, and dedicated coaches, our players will be unstoppable. Shekhar comes from a very humble background with no schooling. He worked as a ball boy at the KSLTA. An accident 11 years ago left him with an amputated leg, which is when the KSLTA introduced him to IWTT. 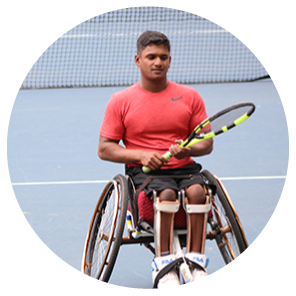 We funded his customised, state-of-the-art sports wheelchair to help him elevate his performance. We sponsored and managed his tournaments enabling him to jump from an ITF ranking of 434 to 189 in 5 months. He is the current number one National Wheelchair Tennis Player. He has won 3 Nationals Singles – 2011, 2013 and 2015. In 2015, he also won the Doubles at the Bangkok Open.